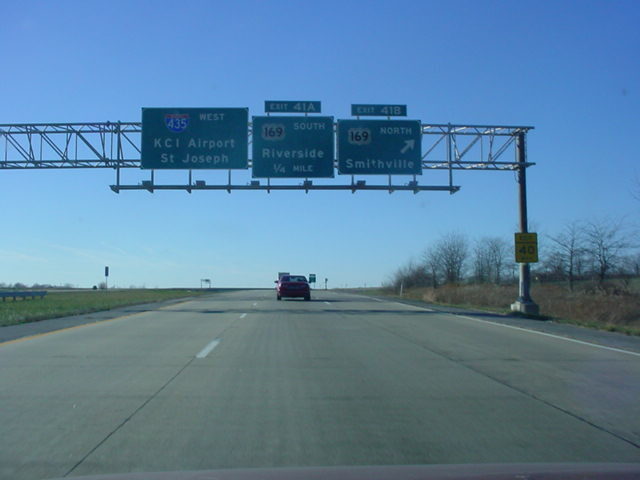 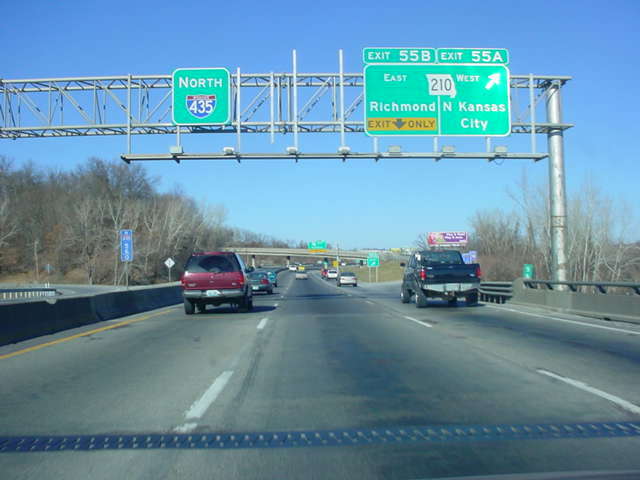 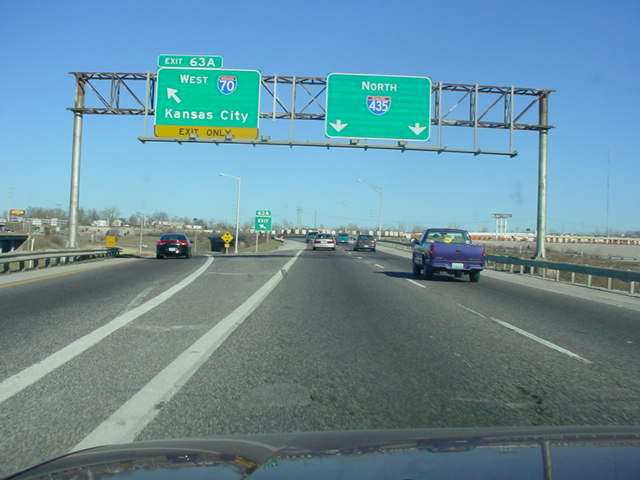 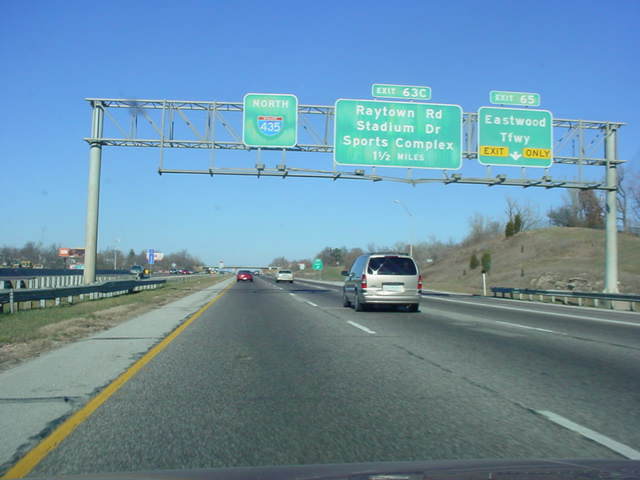 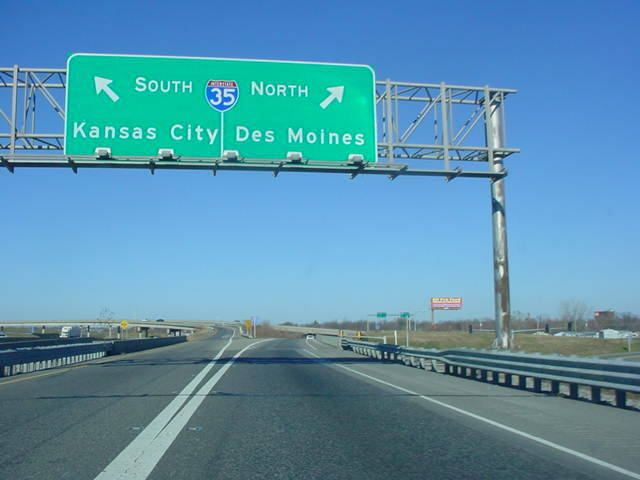 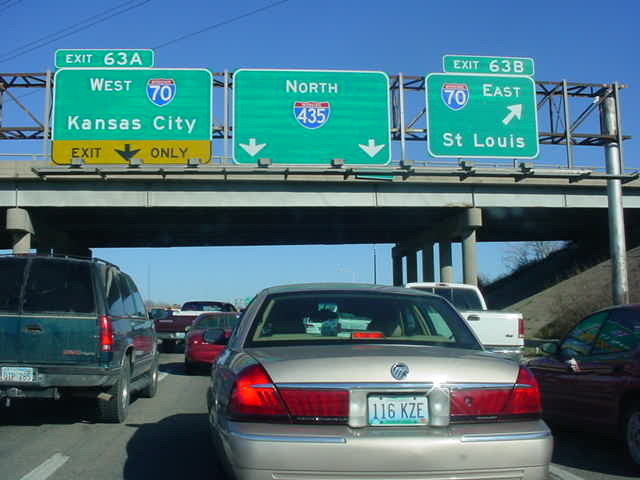 Interstate 435 is the outer beltway around Kansas City. 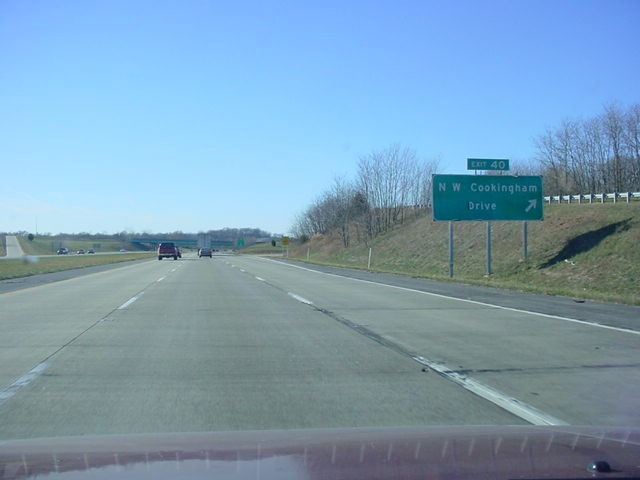 It is about 83 miles long overall, which makes it the second longest beltway in the country, behind only Interstate 275 around Cincinnati. 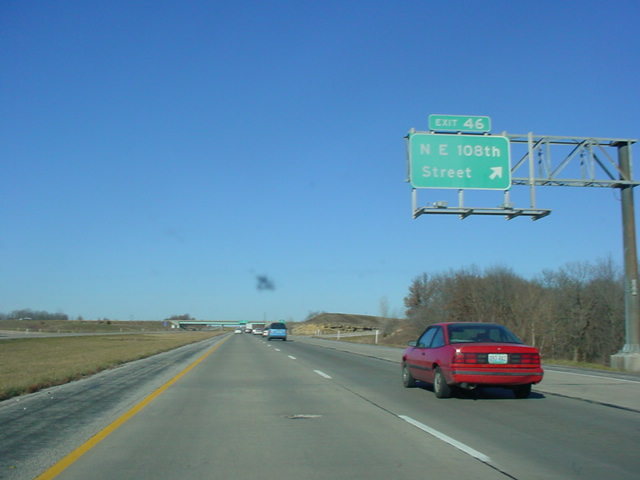 Two views of Interstate 435 East at Exit 74 - Holmes Road. 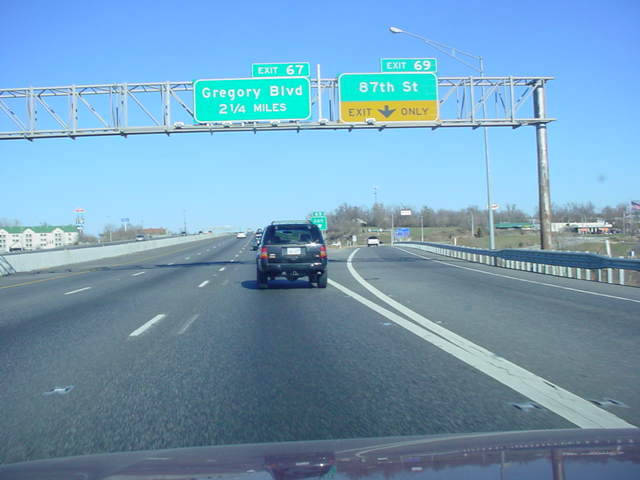 Interstate 435 East approaching the Grandview Triangle. 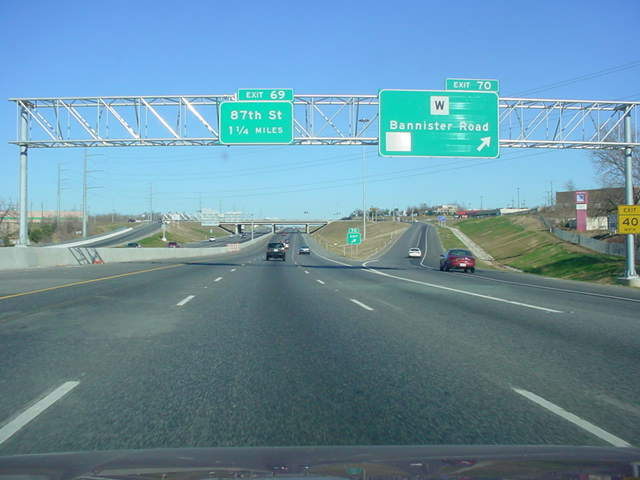 Interstate 435 North at Exit 70 - SSR-W - Bannister Road. 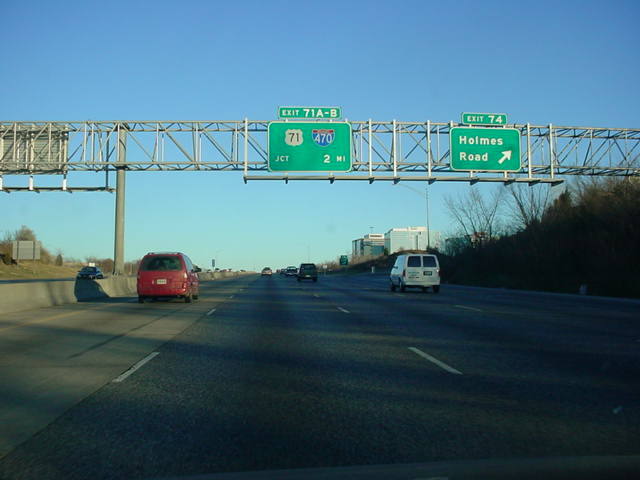 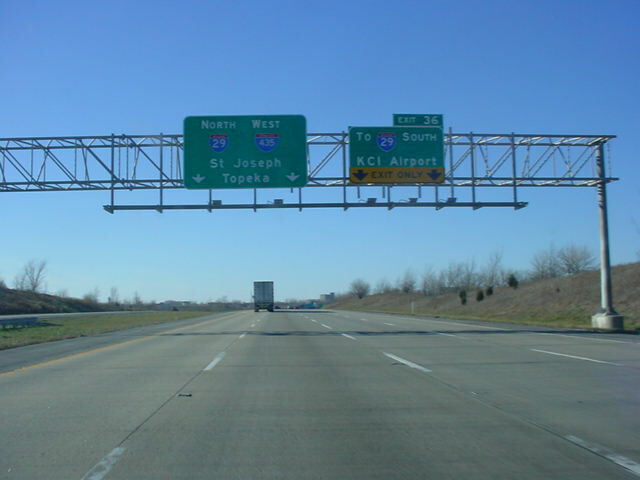 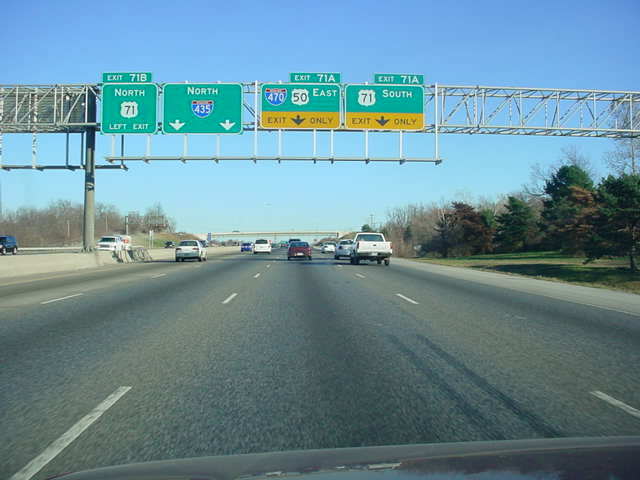 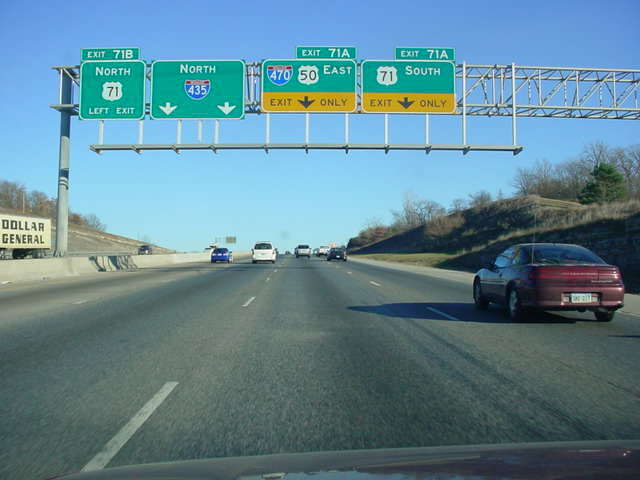 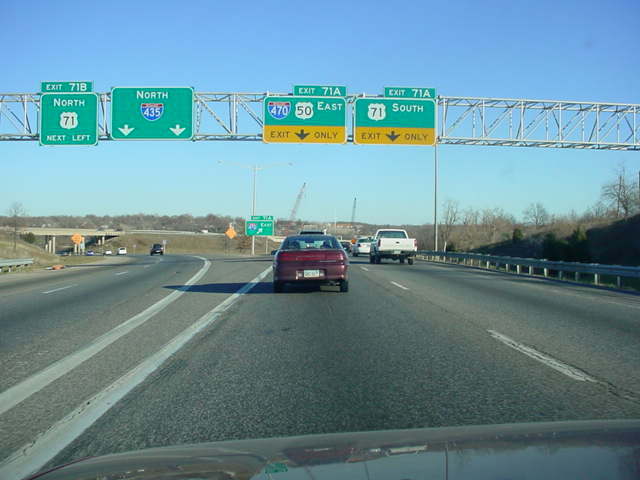 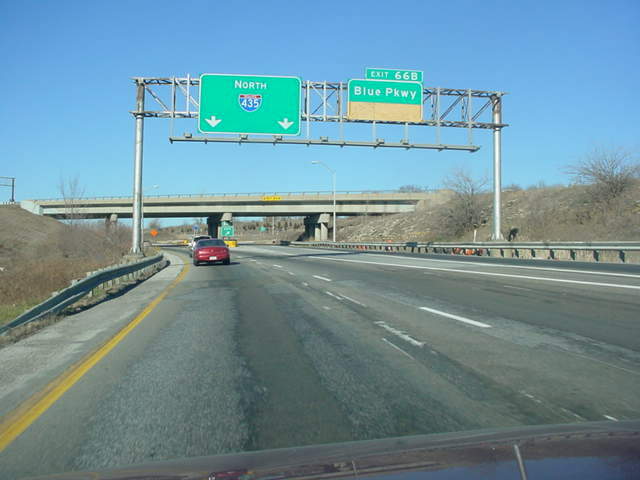 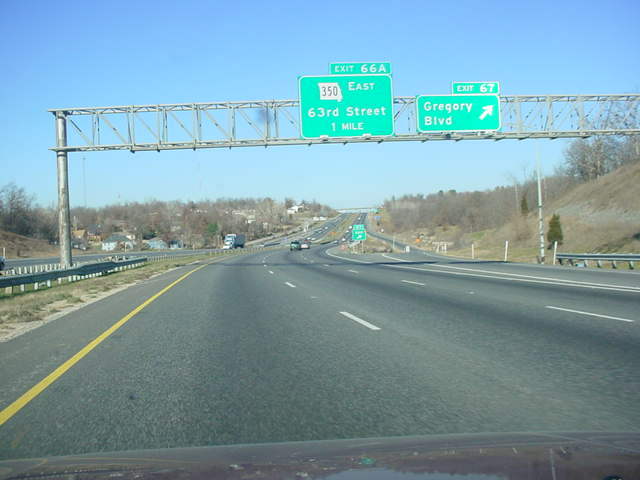 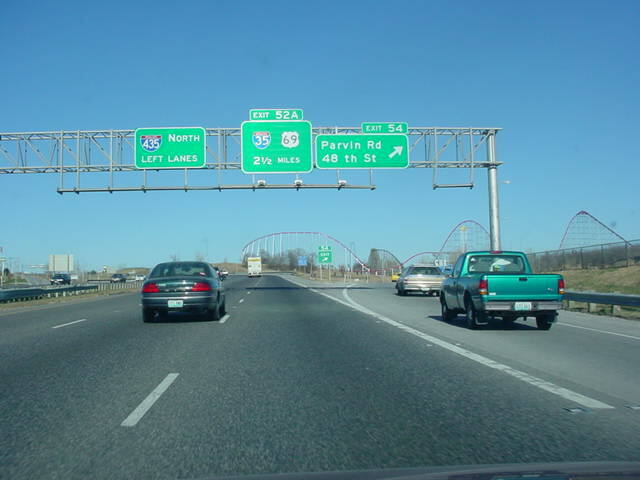 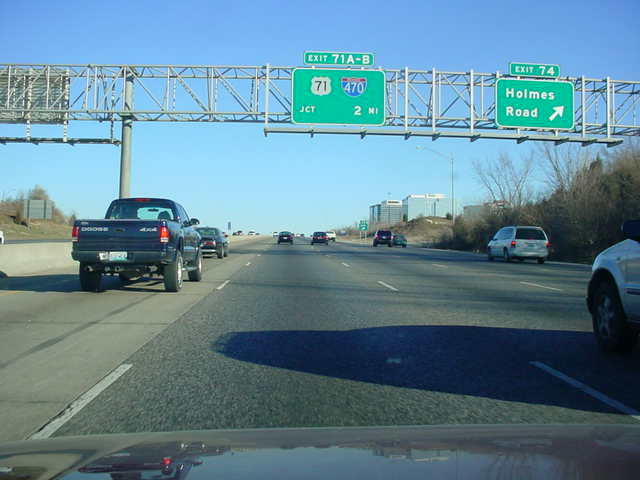 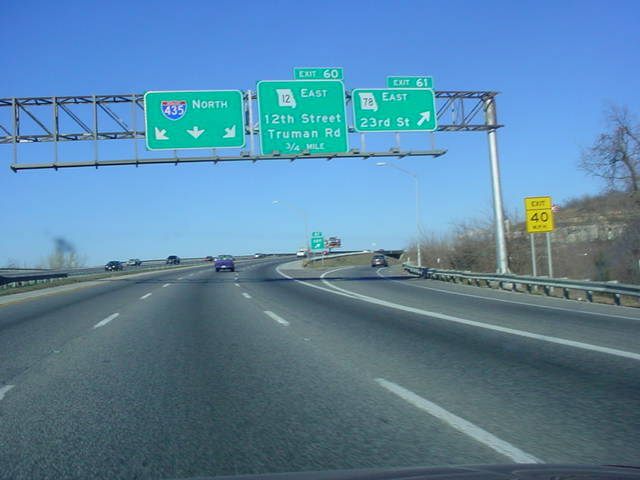 Interstate 435 North at Exit 63B - Interstate 70 East - St. Louis. 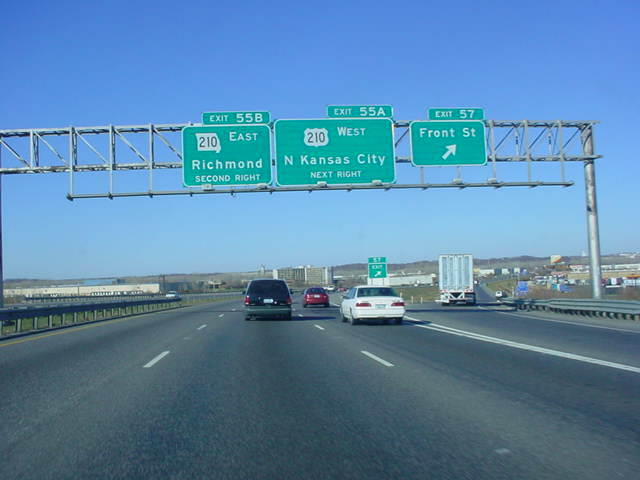 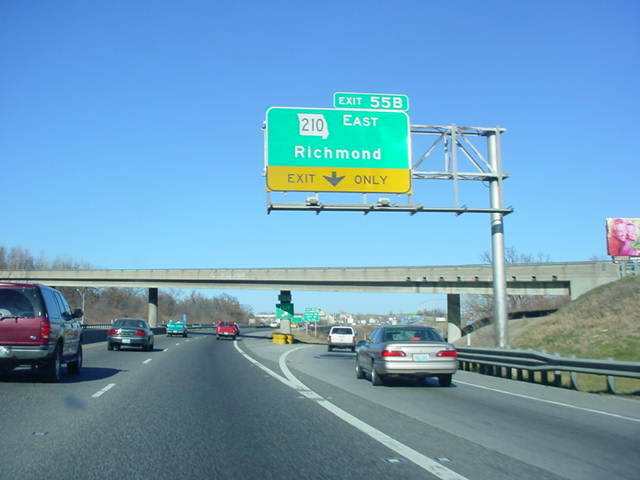 Interstate 435 North at Exit 55B - MO 210 East - Richmond. 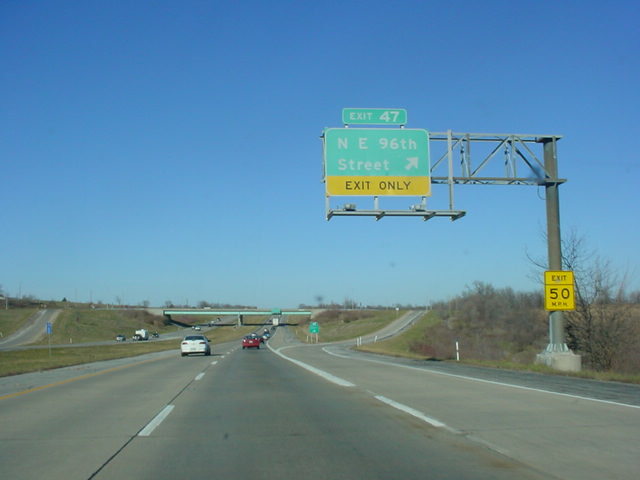 Interstate 435 North at Exit 49B - MO 152 East - Liberty. 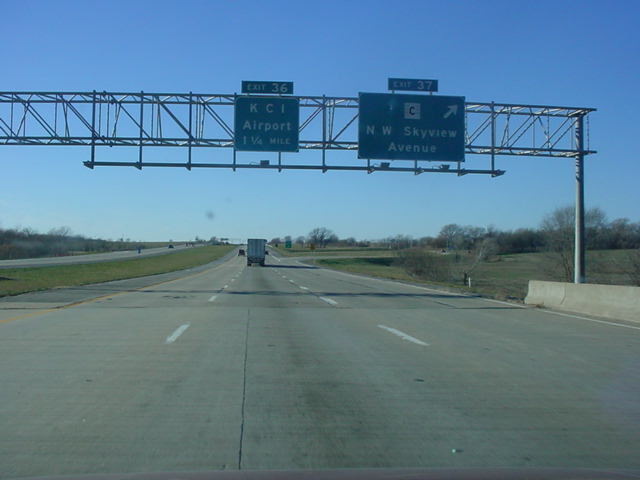 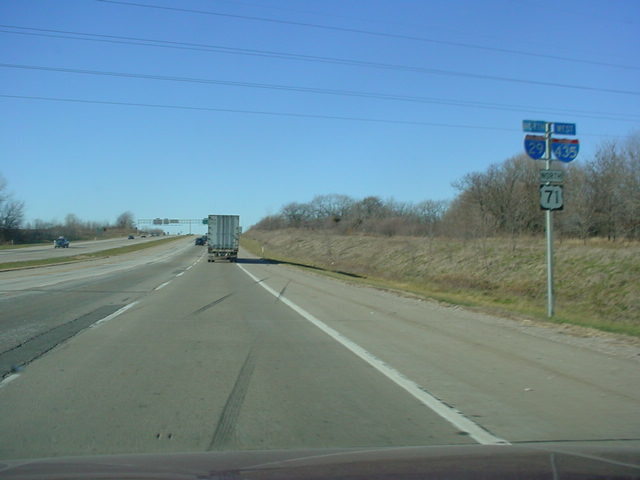 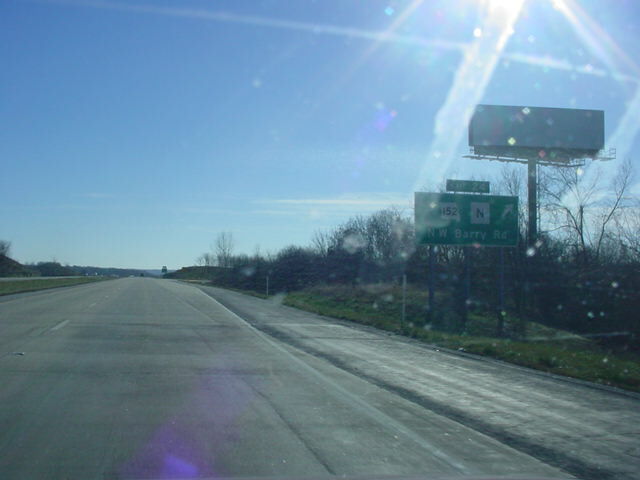 Interstate 435 West at Exit 41B - U.S. 169 North - Smithville. 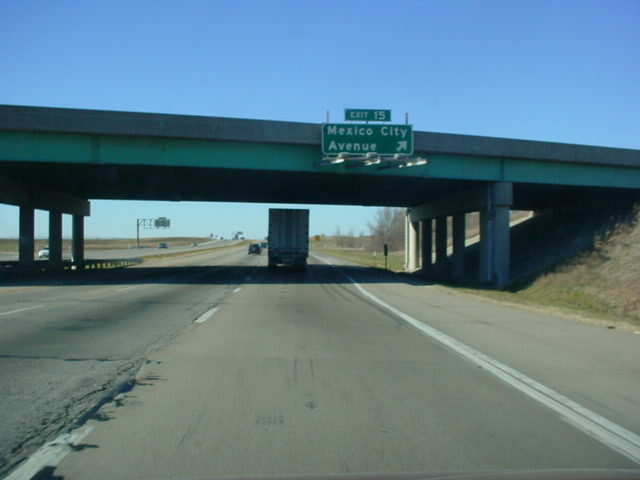 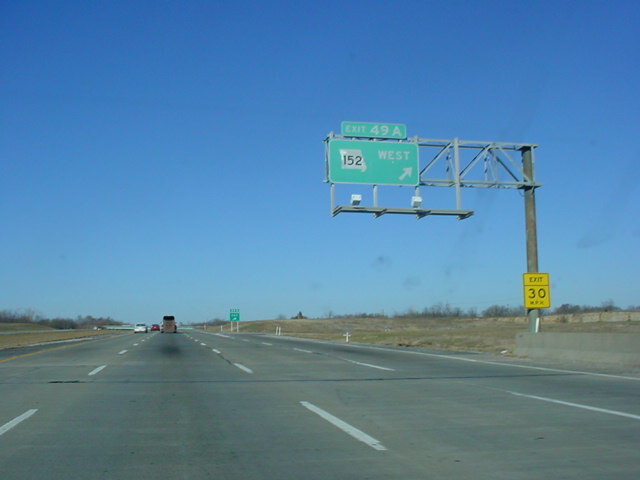 Interstate 435 West at Exit 41A - U.S. 169 South - Riverside. 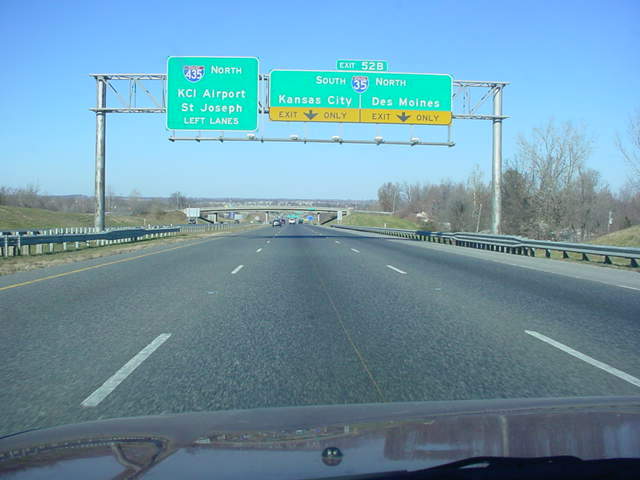 Interstate 435 West at Exit 40 - N.W. 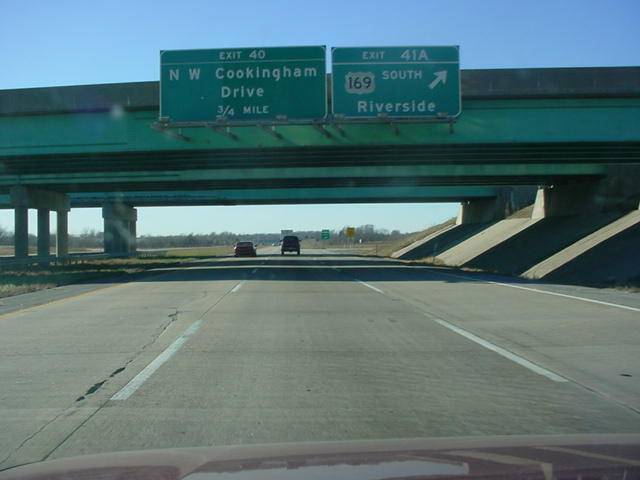 Cookingham Drive. 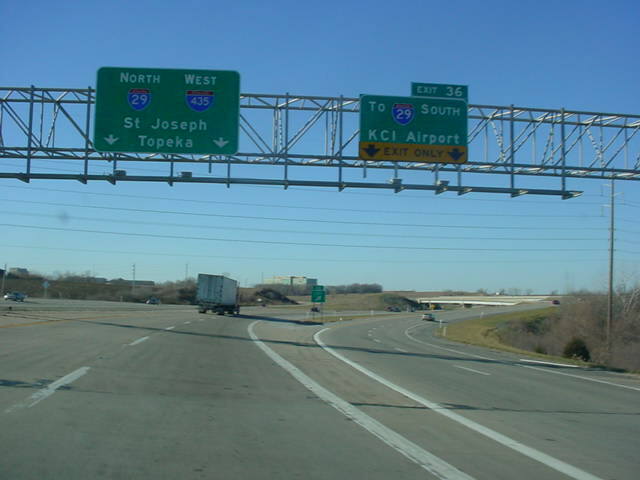 provides access to the Kansas City International Airport. 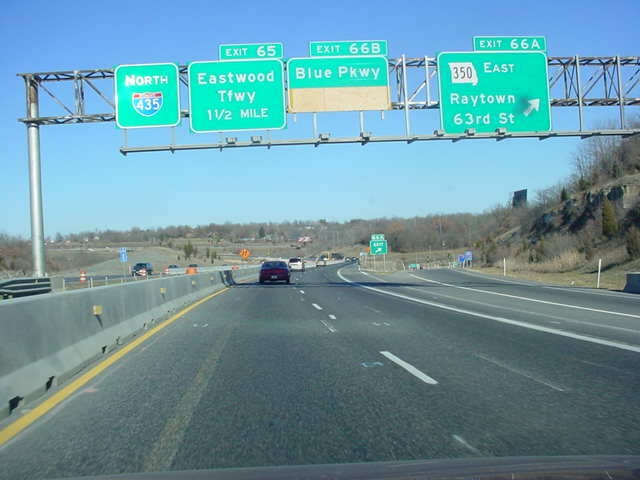 Interstate 435 South at Exit 24 - MO 152/SSR-N - N. Barry Rd. 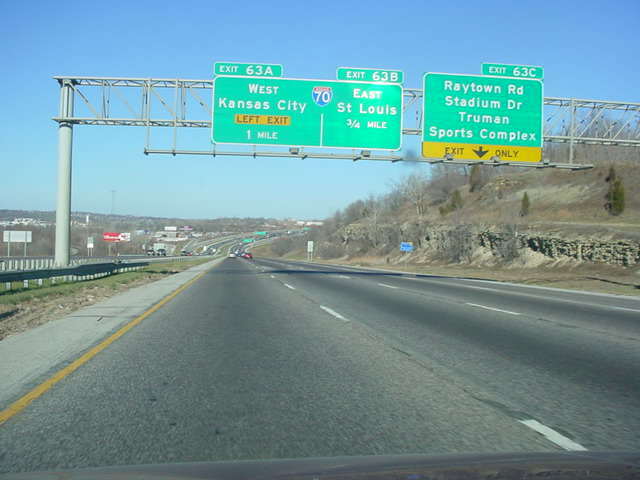 to the other side of Interstate 435 east of Kansas City. 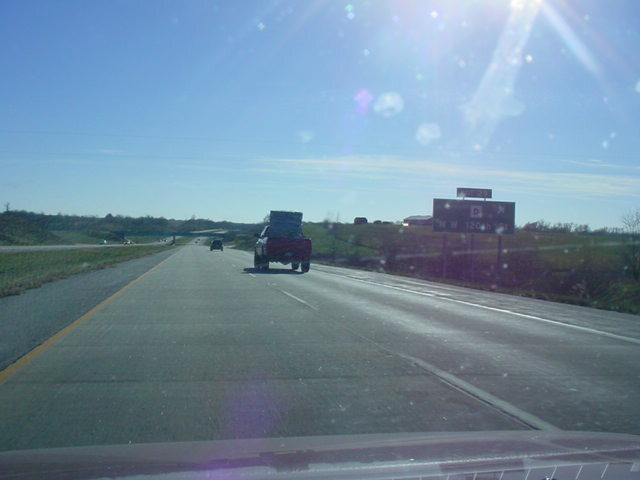 Interstate 435 South at Exit 22 - MO 45 - Weston/Parkville. 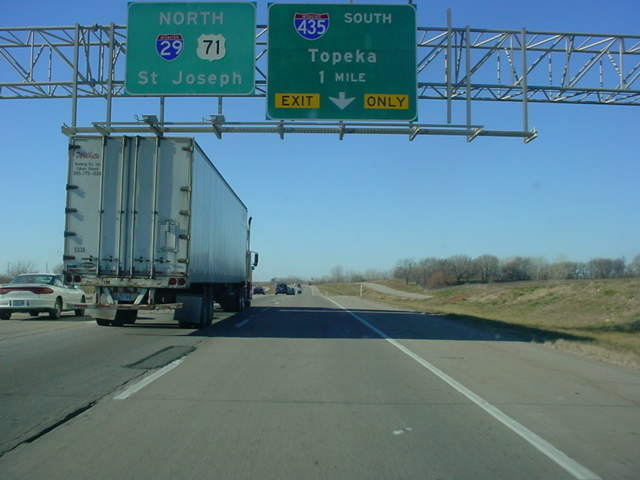 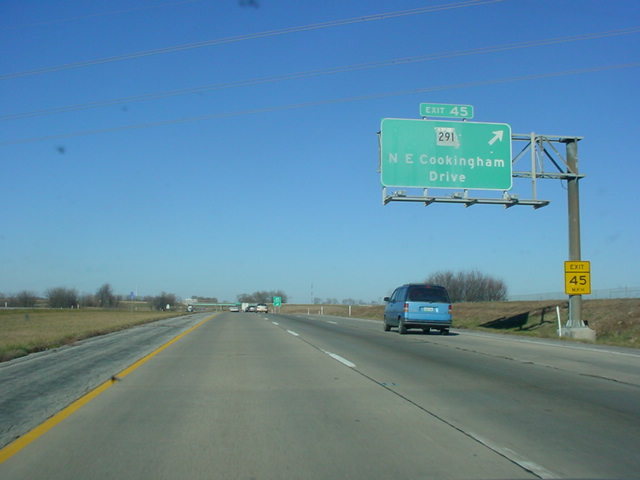 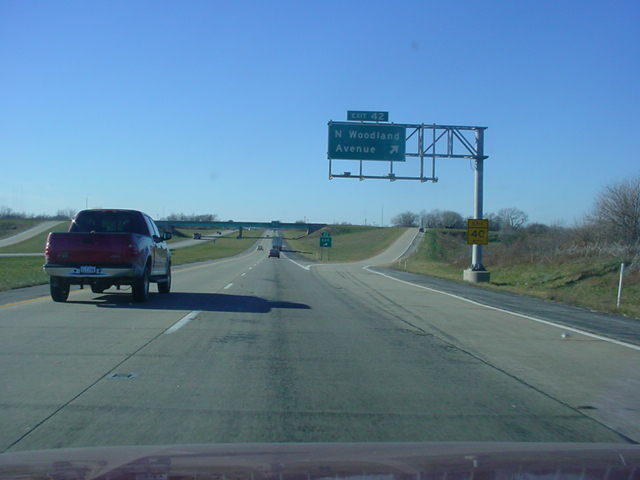 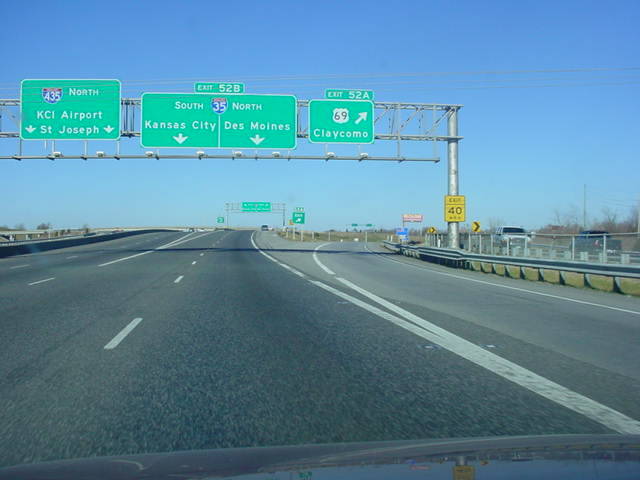 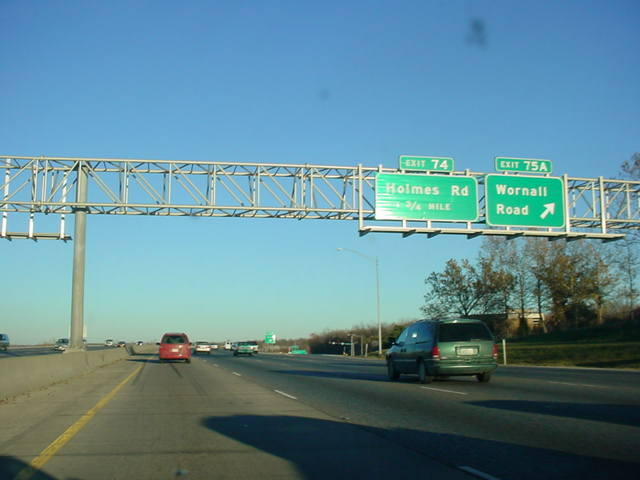 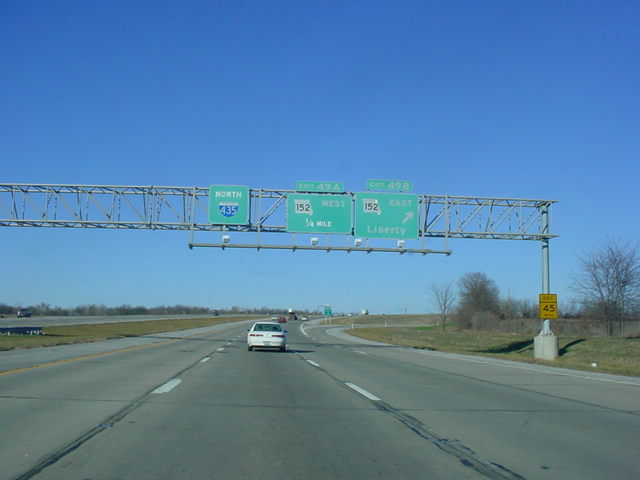 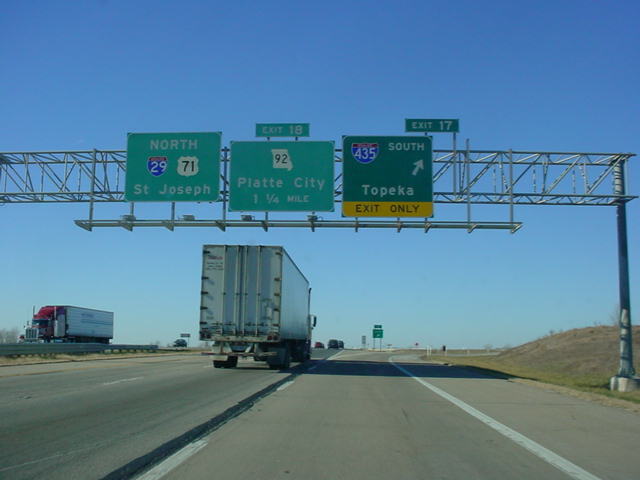 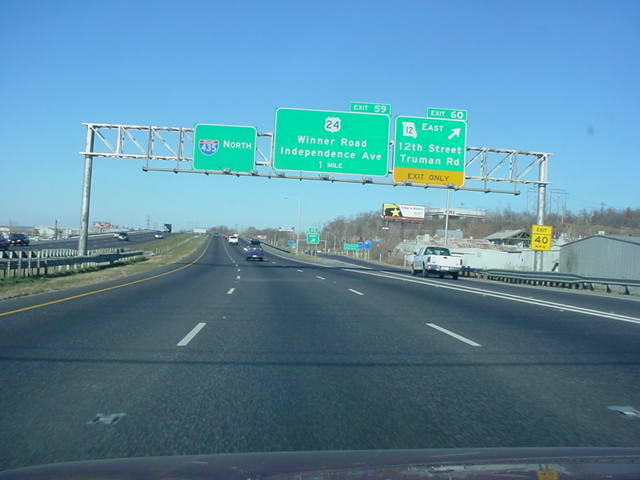 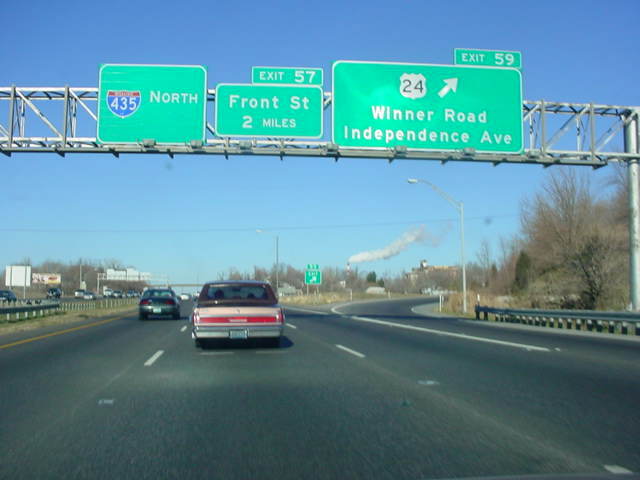 Triangle interchange of Interstate 435, Interstate 470, U.S.
east of Wornall Road. 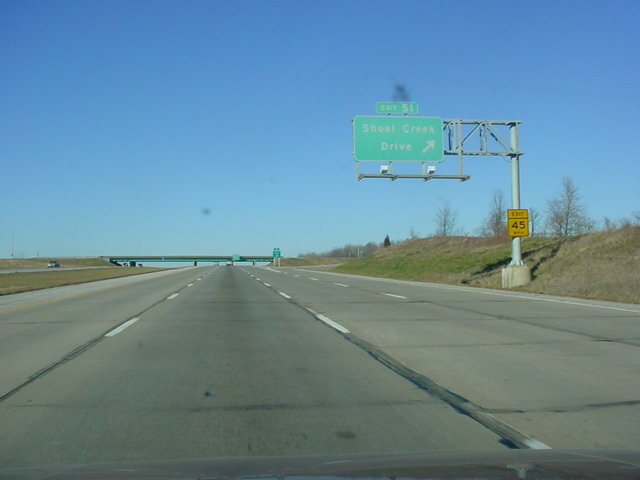 State Line Road is one mile ahead. 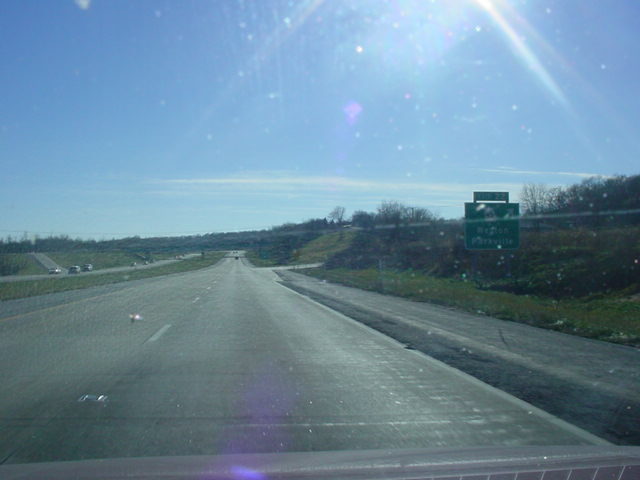 just ahead, and the road quality improves drastically.